Thank you for visiting our website. We have taken the time to develop a website that is user friendly and answers as many of your questions as possible. On this site, it is our goal to tell you about whom we are and what we do and also to make it easy to understand and use the pages. Our Approach to Airport Service and Passenger Transportation . . .
Is your company looking to cut transportation costs? You can use our Reservations Page to reserve a ride or request a price quote especially if you need a ride that’s different than what’s listed on our Prices Page. Please use the information on our Contacts Page to contact us for any questions or concerns you may have. We are a minivan passenger transportation service located in Kitchener, Ontario. With a transportation background, including professional driving as well as planning, scheduling and customer service, we decided we were well suited to effectively run a passenger ride business. We started in June 2007 driving motor vehicle accident patients to and from medical assessments in Toronto. We’re about providing a safe, practical and affordable ride for you our passengers. We are about clean, neat, well-maintained, dependable, courteous, and helpful – for both our drivers and our vehicles. Our service is not about upscale luxury limo with either our vehicles or our drivers. We don’t expect too much that you’ll call on us for your wedding, graduation or a trip to the lottery office – but you never know. But if you do, we’ll happily do that too! We don’t charge extra for the little things like larger luggage pieces, a quick stop at the store or coffee shop, dropping off your house keys or perishables at your Auntie’s or in-laws or properly helping you load your luggage onto the airport luggage cart, etc. We serve all of Waterloo Region and Wellington County and provide a variety of ride services both airport and non-airport. 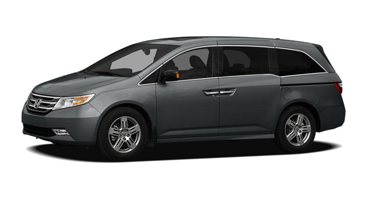 Minivan service – more room and comfort for passengers, more room for luggage – a better value. A fair luggage policy – if it fits safely, we will take it. Private rides as well as share-and-save rides. Fast, direct and uninterrupted trips. A professional passenger driving service with a relaxed atmosphere. We want to gain your loyalty with our friendliness and great service. 24/7 operation including all holidays. Door-to-door service to and from your home, hotel, airport, transportation station or place of business. Kitchener, Waterloo, Cambridge, Elmira, Baden, New Hamburg, Wellesley, Guelph, Elora, Fergus, Belwood, Erin, Arthur, Drayton, Mount Forest, Moorefield, Palmerston, Harriston and all surrounding areas. Airports We Service. . .
Vista Ride Service is insured and licensed by the Ontario Highway Transport Board of the MTO and the Greater Toronto Airport Authority (GTAA).